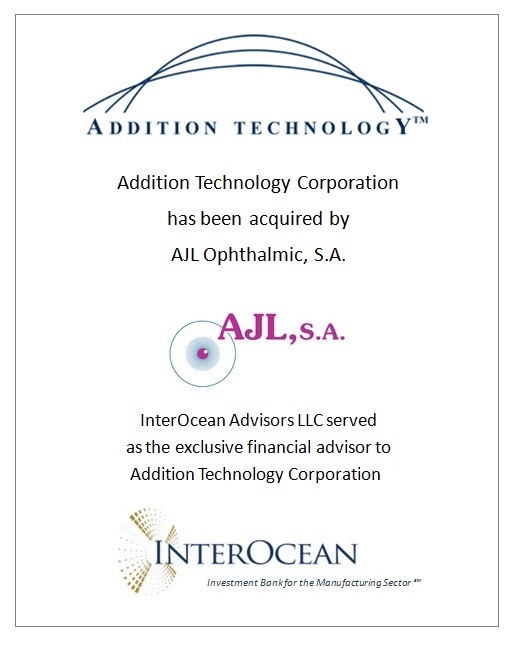 InterOcean Advisors LLC (“InterOcean”) announced today that Addition Technology Corporation (“Addition Technology”) has been acquired by AJL Ophthalmic, S.A., a manufacturer and marketer of diagnostic and treatment ophthalmic devices serving the European continent. AJL Ophthalmic, S.A. is headquartered in Minano (Alava) Spain. InterOcean served as the exclusive financial advisor to Addition Technology. Addition Technology markets a suite of corneal products, including Intacs corneal implants which address keratoconus and other ectatic conditions of the cornea. Over 750 ophthalmic surgeons worldwide have been trained with Intacs and have performed over 75,000 procedures. Intacs is the subject of 140 peer-reviewed articles. Addition Technology is headquartered in Sunnyvale, California. The transaction offers significant benefits to AJL Ophthalmic, S.A. It provides an opportunity for AJL Ophthalmic, S.A. to extend its entire product and distribution reach commercially to the U.S. and the rest of the world. AJL Ophthalmic, S.A. adds the key Intacs brand and product to its portfolio. Immediate synergies are recognized for the manufacturing of Addition Technology products and for its international business.